Following the most recent data loss by HMRC, they and other companies should seriously start considering dumping laptops in favour of Sun's Sunray technology for their "Work from home" users, and maybe even all of their normal desktop users. For those who don't know, Sunray is a secure, truly stateless device that effectively presents a working desktop environment to a user over the network and consumes very little power. Think of a mix between the ease and simplicity of the old green and black dumb-terminals and the full functionality of your normal desktop and a whole lot more. As the Sunray is stateless, NOTHING is stored on the device itself. It's all stored on the remote server and transferred between your Sunray DTU as and when you need it. What's more, the latest Sunray software includes the ability to encrypt the traffic between the server and client. It's also got fancy new technology that allows it to run at fantastic speeds over a normal broadband connection. This is what is allowing Sun to roll out their "SunRay @ Home" project. The Sunray @ Home is a little more complicated as it uses VPN as well, but it's still no more complicated than connecting a few wires together and slotting in your Java card. One of the coolest features of Sunray is the ability to pick up your session, on a completely different Sunray DTU, exactly where you left it. For example, imagine you're working on an important document at work and 5:30 rolls around. You pull out your Java card, pop it into your pocket and head home. When you're at home, you slot the Java card into the Sunray at home and your session from work appears EXACTLY as you left it. If you've got Sunrays in the office, imagine how easily you can hot desk. Now I'm sure you can see the security implications of using Sunrays. As nothing is stored on the device it doesn't matter if it gets stolen - your data is still safe and secure on your servers. All traffic between the DTU and server can be encrypted and man-in-the-middle attacks are also not an issue as the Sunray server software takes care of this too. How about another benefit that will keep any accountant happy - it'll save you a lot of money. We all know companies spend a ton of money, every 2-3 years, updating all their user desktops, laptops and often at the expense of something else, like the servers. There's also the added cost of maintaining, licensing, upgrading and supporting each of these desktops, laptops and servers. With Sunrays, you buy the Sunray DTU once and then concentrate all your efforts and resources on the server side of things. 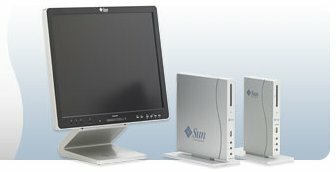 The Sunray DTU on my desk at work has been the same Sunray DTU for the last 4 years - I've not had to upgrade it once and I've gone from running Solaris 8 all the way up to Nevada, in all it's glory. Short of switching to a higher res monitor, I can't think of any reason why I'd ever need to upgrade my DTU. If the DTU does fail, you just phone up Sun and they'll replace it . Quick and simple and without the need of backing up and restoring data. Now for the server side of things. The Sunray Server software runs on Solaris and Linux, however that doesn't exclude your Windows users - you can present Solaris, Linux AND Windows OS desktops to your Sunray users. Or, with the help of Sun Secure Global Desktop Software, you can present just the necessary application windows on ANY desktop environment. For example, you can force all your users to use a secure and locked down Linux or Solaris desktop, but still present them with that important Windows only application. What's more, you can lock down ALL your users as much as you like, all from the server. You also only need to backup, maintain and upgrade one or two machines in your entire network - the Sunray server and any other servers you may use for data storage or other server side processes. I'm a big fan of the Sunray technology. It makes sense on so many levels, and now with the likes of the new Sunray 2N laptop on the cards (currently only available in Japan), you can have the portability of a laptop AND the ease and security of a Sunray. Other than uncertainty, I really can't see any good reasons why not to use Sunray technology.